The 1960s was in hindsight the make or break point for UK civil aircraft manufacturing as a major player. 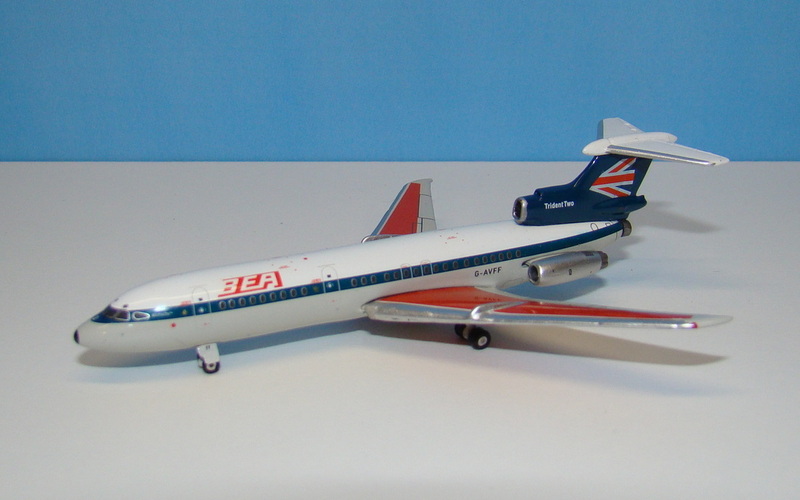 We all know how it went and certainly BOAC and BEA are partly responsible for forcing manufacturers to produce aircraft that suited their purposes and nobody elses. Even BOAC and BEA's requirements tended to change before service entry leading to their own unhappiness with the VC-10 and Trident. Anyway both the VC-10 and Trident were fine aircraft in their own rights just not suitable to compete against US types and / or gain entry to the fiercely protectionist US market place. The Trident was too small (by BEA's 'request') and HS spent its development increasing its size. It was however a technologically impressive machine especially in the avionics department, though take-off performance was awful. Lookswise the cockpit windows and odd offset nose gear always made it look rather old fashioned, compared to the 727, but it has a certain charm about it nonetheless. The Trident 1C entered service on April 1, 1964 after a maiden flight in 1962. The improved 1E version had extended wing chord, uprated Spey 511 engines and could seat 140 passengers six abreast. It didn't sell well to say the least. Only 39 Trident 1s were built. 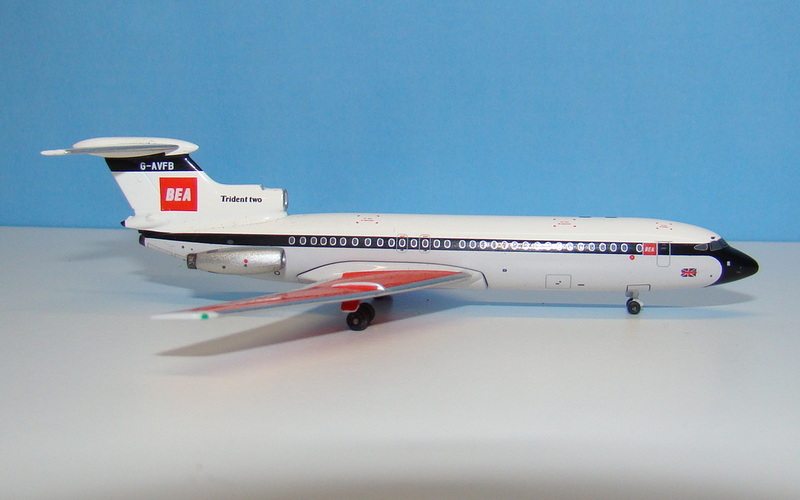 BEA took all 25 Trident 1Cs whilst the remaining 14 1Es were split between Kuwait Airways, Iraqi Airways, PIA, Air Ceylon, Northeast and Channel Airways. The Trident 2E was a re-engined variant (with Spey 512s) also equipped with new low-drag wingtips and with better range due to increased fuel capacity. 50 were sold though 33 of these were to CAAC which has the whiff of a political buy. All the rest went to BEA except 2 for Cyprus Airways. Gemini have done a very nice Trident 1 mould and made 8 models on it (all the delivery operators plus BKS and Pakistani Air Force). Interestingly none of them are BEA examples. Gemini also made 6 Trident 2s (BEA 2 versions, BA 2 versions, CAAC and Cyprus Airways) using the same mould. Several of the Gemini examples (though none are ones I own I'm told the Iraqi one is bad) have the left side printing too high. Aeroclassics also entered the Trident arena soon after Gemini although it seems they were rather gazumped by Gemini and in the end they only released 2 Trident 1s (PIA and a BEA/PIA hybrid) and 5 Trident 2s (BEA and four Chinese examples). The mould is like the Gemini very good but the two do have obvious differences between them which we'll investigate further. The Gemini mould clearly sits taller at the rear partly as a result of the larger tyres they have used. The Gemini is also generally chunkier in terms of the side engines, mid-engine exhaust and tail fairing. In fact the tail fairing on the Gemini is definitely over-sized and the Aeroclassics better in this respect. Then again the size of the mid-engine intake on the Gemini appears to be larger and more correctly sized than the Aeroclassics. Gemini has not replicated this and the fuselage has a circular cross section into which the wings are slotted. AC got the shape right but the downside to this was it has left an obvious seam. The nose on the Aeroclassics versions is a bit pointier than the Gemini - possibly a bit more like the real thing but they're both good. Another difference between the moulds is that the Aeroclassics version doesn't replicate the streamlined Kuchemann wing tips which were on the Trident 2E but not the Trident 1. Gemini has replicated these wingtips so both manufacturers get it wrong depending on which exact variant they are using the mould for. Its a very minor thing and hardly surprising that neither manufacturer created separate moulds for the 1 and 2. By the mid 60s BEA had realised its traffic predictions were bunkum and wanted a larger Trident - basically as it had been originally designed. 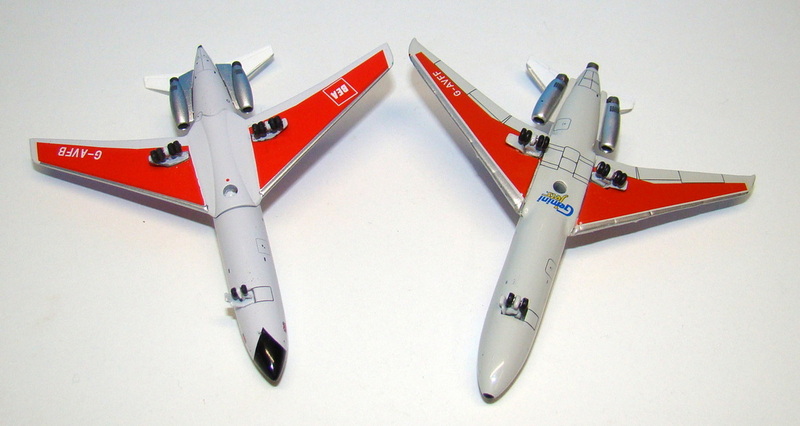 Hawker offered them two versions but by 1965 BEA had decided it preferred US types and wanted to buy 727s (and 737-200s rather than One-eleven 500s). This was vetoed by the UK government and so reluctantly BEA went back to the Trident and opted for a stretch. Unsurprisingly stretching the fuselage by 5m and keeping the same engines did nothing for performance so HS hid a fourth engine in the tail which added 15% extra thrust at takeoff. This new Trident 3 could seat up to 180 passengers. Regardless of the changes competing against the 727-200 was not a success and aside from 26 bought under duress by BEA only two more were sold - to CAAC (as Super Trident 3Bs with extra fuel tanking). Gemini has produced the only mould for the type with 6 releases and I own 4 of them. I always thought the nose on their Trident 3 seemed a bit big and blunt however generally its a decent mould.